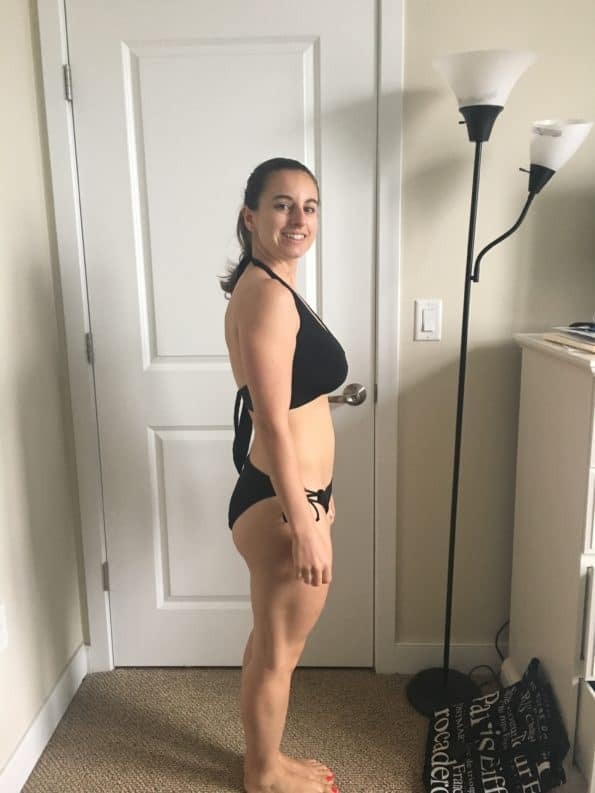 I keep procrastinating kicking off this post about “where I am” on my fitness journey because I want to be further along on it. Which when you think about it, makes no sense because a post about progress is exactly that. However, I’ve been giving weight loss tips on here and social media for a bit now, so I feel like it’s time for me to share my story of the good and bad that got me to where I’m at today. Progress is not linear. In fact, in my experience it’s been anything BUT linear. There is no “end point”. Sure, we might reach a state where we feel content, but since we’re constantly evolving, there is no such thing as a static phase/moment. So, based on those 2 realizations, the only thing we have to rely on for our health (or any) journey is that we have to keep going, even if we don’t know if we’re going forward. In the near future, I will share the details on my workouts, nutrition, and mistakes that got me from my “before” photo in 2013 to now. Overall, I lost 20 pounds, but more important were the body composition changes that happened for me between losing fat and gaining muscle. For now, I wanted to share with you the more personal story of my journey that the numbers don’t tell. I’ve always been an active person. Except for those few years in grad school when I wasn’t and was the heaviest I’ve ever been. I was never an athletic person per se though. Zero hand eye coordination. I’d rather be running away from a ball being thrown at my head, thanks. But on the other hand – strength and endurance were (are) my thing. From 2 years old through college I danced weekly for hours on end. Training in everything from pointe to hip hop for recitals, nutcrackers, competitions, halftime performances, fundraisers…you get it. In high school, we practiced 12 hours a week, if not more. In college, it was less intense, but I still got my fill of being in the studio and performing. Dance made me appreciate not just using your body as an art form, but how to reach down into your core for both strength and grace simultaneously. Being that active gave me the leisure of having a very large appetite. However – by no means was it a healthy appetite. For instance, I would come home from dance practice at 10:30 pm and have ice cream. Regardless, I was still able to remain lean – but for all the activity I did, you would expect it to show more. The change from high school to college was significant for me in terms of reducing my very active lifestyle, but increasing the amount of calories I was consuming on a weekly basis. Ah, yup, the dreaded freshman 15. I gained the “freshman 15” gradually over the course of my undergrad years and then spiked it with another 10 pounds during a semester abroad my fall of senior year. I studied abroad in Paris where butter is king, bakeries double as lunch cafes, and prix fixe menus (individual serving for appetizer, entrée, and dessert) are the norm. My weakness was (and still is) the pastries. I have a serious soft spot for a croissant and justified having so many (re: my breakfast every morning), by asking myself “but when will you ever LIVE in Paris again?”. The answer was probably never, so indulge I did. I can’t say I really regret eating decadent foreign food for 4 months, but I did learn a lesson about moderation, proportions, and being active. Fast forward one year to 2013 where I was in my first year of grad school studying architecture. I could no longer participate on the dance team since my course load and thesis took up my time entirely. My stress level was immense – on top of school, my car had just been stolen, and I was also dealing with crippling vertigo that seemed to have come out of nowhere. I could hardly move, forget about working out. At the time, I was only told it was my anxiety (more on this later), but it of course was not. All of this lead me to further develop my comfort in food. I was just starting to cook for myself and relied heavily on pasta, butter/oil, and fatty meats. Not to mention, when I was too busy to cook for myself, fast food and takeout were my backup. One night that I was up late working from home, an infomercial caught my attention. It was for Insanity by Shaun T which aired all the time in 2013, but in case you haven’t seen it, it’s an intensive home workout video series that lasts 6 weeks. The one-hour HIIT (high intensity interval training) workout videos are 6 days a week. I remember feeling like I didn’t recognize myself and like I was getting sucked into a black hole of living a progressively unhealthy lifestyle. About a week later I ordered the program. At the time I didn’t think this would be a pivotal point in my life that I would still be able to recall. 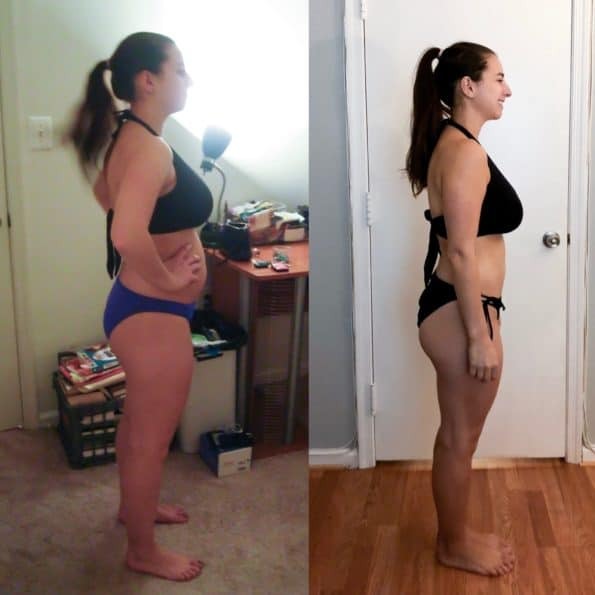 I wish I could tell you that I completed the program with ease and lost the 25 extra pounds in an instant, but this was not the case. What did happen though was that I struggled to even complete the “fit test”. Yeah, the workout BEFORE the workout. I panted, felt like I would faint, have a heart attack, or all of the above. It was not pretty. But at my own pace and fitting it into my own schedule with grad school, I completed the program. During these couple months, I didn’t alter my diet too much, but I think it did inspire me to make more nutritious & conscious choices when I could. I didn’t “lose weight”, but it didn’t matter just yet because my body had entirely changed. I had muscle definition again. I could run without thinking I was going to have a stroke. My clothes fit better. I felt strong. But most importantly, I gained a sliver of my health & confidence back. 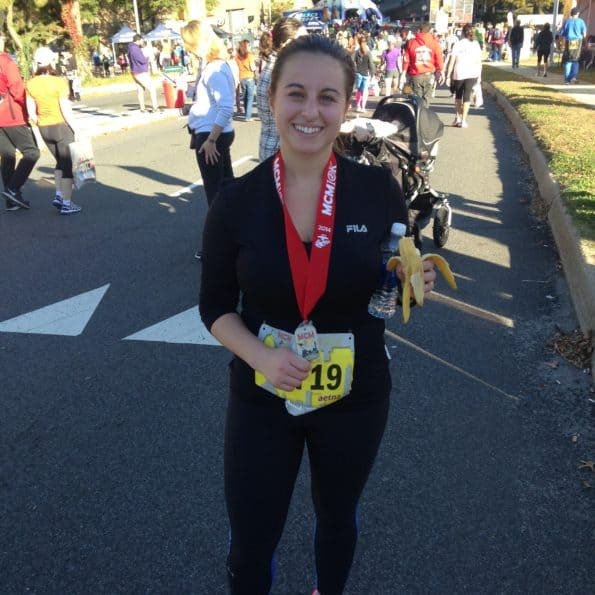 In fact, in 2013 I ran my first ever 5k! This journey really developed in 2014 & 2015 when I focused on keeping my newfound muscle and losing the 25 pounds of fat that lie on top. I knew the area I had to concentrate on was what I was eating. While on vacation, I found a clean eating cookbook and it became my holy grail. This book taught me to cook from real whole foods – leaving behind the processed junk and fast food I loved. In turn, I ended up reducing my overall intake, but increasing the quality of food I was having. I never looked back & even stopped craving the late nights to McDonald’s in walking distance. I continued my love for working out as well, despite subluxing my shoulder (like dislocating). I finished another 5k & my first 10k. That year I also set out to do Insanity once more (correctly this time) and started weight training again for the first time since undergrad. Weightlifting felt so similar to dance to me. I became addicted to the feeling of pushing your body beyond what your mind thinks it’s capable of. I felt like I found a new passion for fitness. Through all this activity, a better understanding of how our bodies work, eating nutritiously, and meticulously tracking what I ate, I reached my goal and lost the 20 pounds and was the most in shape and fit I had ever been. Progress is addicting and the success made me change my goals again, now aiming to reduce my body fat percentage to 20% and increase the amount of muscle I had. In 2016 I was ready to lose those last 5 pounds and embark on fitness territory I never even saw in high school. One morning in April I tweaked my back while I was deadlifting. I completed the rest of my workout and gave myself one day of rest that week. I had pulled my back in the past and it was nowhere near the acute pain I had experienced previously. I was impatient to get back to my routine and saw my injury as an inconvenience that I couldn’t slow down for. I didn’t have time to let my body heal. That year, I experienced never-ending cycles of recovery and re-injury. I strained my lower back 6 times. Luckily, the injury wasn’t spinal, but it was becoming chronic. To say that I was disappointed was an understatement. My fitness goals had started to define me and working out had become an integral part of my day – something I couldn’t wait to do. Injuries are absolutely a test of mental toughness. They leave you feeling isolated and dependent. During the worst of it, I couldn’t put my own shoes or pants on. At times I felt depressed, scared, motivated, sad, jealous, and downright angry. But – with a lot of support and patience my back was mostly healed by spring of 2018 – where I was able to weight lift and run again. I’m still dealing with residual flare ups and tightness – but I have seen a big improvement over the years. I will definitely share more details about my back pain since it is something we all deal with at some point and, I know, can be a major barrier to reaching your goals. What my injury still teaches me is that sometimes slowing down is exactly what we need. For 2019 my health goals are from a more holistic approach. I want to mention that the vertigo I felt years ago was diagnosed as Vestibular Migraine by a neurologist 1 ½ years ago. I still struggle with it and finding balance with food triggers and meditating is one of my goals for 2019. I will be sure to share my knowledge and resources for vertigo & migraine too because it is so common (more common than you think!). As for my back and fitness, I’m picking back up where I left off in 2016 which was to cut down my body fat to 20%. I’m doing this by paying attention to my energy balance on a daily and weekly basis – calories in, calories out. As well as my balance of macros (protein, carbs, and fats) to help promote fat loss and retain muscle, as well as grow muscle while I’m getting back into weight lifting. I haven’t felt this strong and had this little pain in a couple years, so its very exciting! Fingers crossed! Constant improvement is what keeps me going. Although if I could, I would just arrive at the finish line. But as we all know – you have to put the work in. So, now that you know me on a bit more of a personal level, I would love to hear your story! What’s your biggest obstacle on your journey or are you at a place where you feel content with your health and fitness? Comment below, find me on Instagram, or send me an email at biteyourcravings@gmail.com!